Right after launching Okhlos, back in August 18th, we kept working non-stop on updates, fixes, and tons of small details. We also started working on the biggest update till date, and now it’s finally out! We changed from 5 to 3 levels long until you reach the worlds’ god. Because we are not perfect, and sometimes we screw things up. But at least we try to fix them! What are YOU doing? 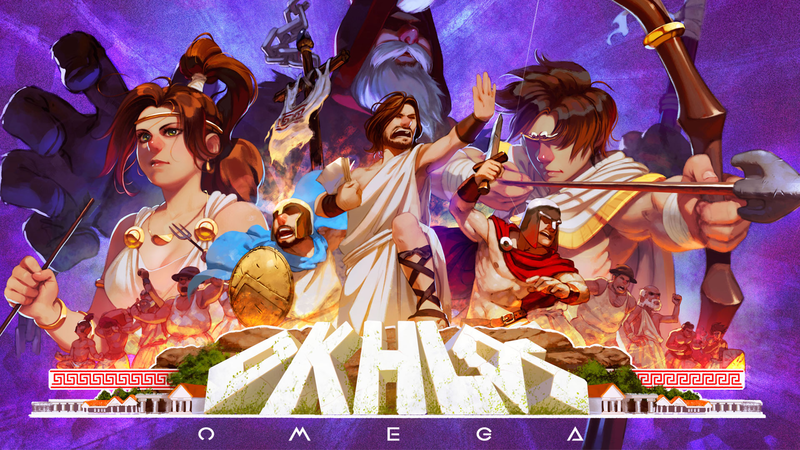 Here is the official illustration of Okhlos Omega. Thanks to our friends at Game Ever Studio for the illustration! Click on the image to enlarge it! 1920×1080 wallpaper ready! 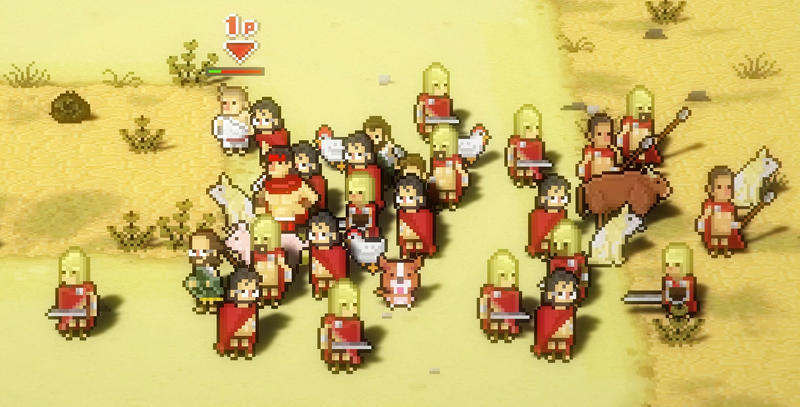 Okhlos Chinese translation available with Omega update! 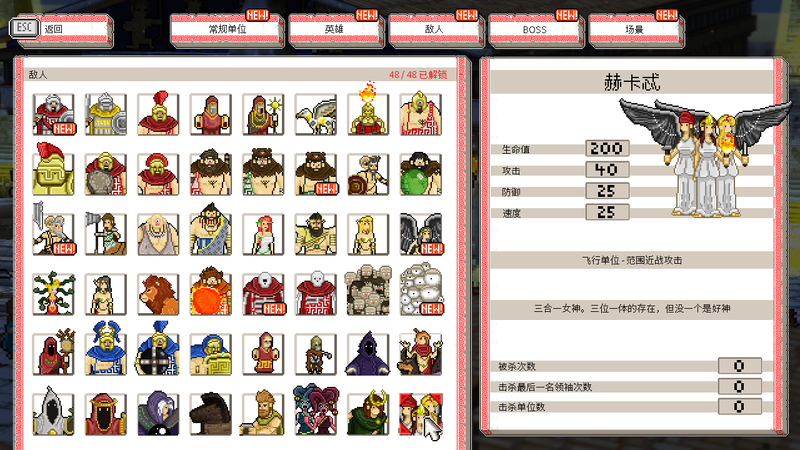 Just a few hours before launching the Omega update, we are really happy to announce that Okhlos will support Simplified Chinese in the upcoming update! Thanks everyone for their hard work! 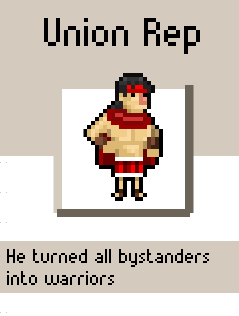 The new Okhlos’ enemies! #GifParty! As you, avid reader of our humble blog knows, we’ve been working on the new update for quite some time now. Today, it’s all about enemies. Enemies are a very important part of every game. And sometimes they can single-handedly determine a huge part of your game mechanics. I mean, most of the challenges in games come from the conflict, so if you have very boring enemies, the conflict, or the created situations will be boring in consequence. So, following that train of thought, we had an interesting variety of enemies before, but we felt that we could do better, that we could push a little further some ideas about enemy mechanics. One of the first things we noticed on the vanilla version of Okhlos (wow, Okhlos vanilla version is a thing now) is that not too many players felt compelled to escape from situations. And the defense button is really good if you catch the correct timing. Also, there are almost no enemies that actually go after you, maybe the Satyrs, but not many. With the kamikaze, you feel forced to escape because they will explode after a short time. Besides that, they explode a few seconds after being killed, so you have to choose the correct moment to defeat them. A whole new type of unit we are introducing in this update are the Champions. They appear only once per world. Like we do with the gods, the order is random so you never know which champion will appear in what world (but we have some rules about which can appear in which world internally). As with the Kamikaze, we analyzed which were the interesting bits of the combat and which were not. Eventually, we came up with some ideas about what would be cool to have. We have what is basically a Hosioi++, he launches 8 fireballs in all directions. You might try to use defense, but depending on the spread of the mob, you might have to do it multiple times to protect every unit. We also have a giant Trojan Horse, which will spawn multiple enemies after being defeated. Not only the feeling of fighting this 20+ warriors is awesome, but the Trojan Horse is the first and so far only character in 3D in the game! We have a super healer, which will be constantly healing the rest of the enemies on the level so you have to attack him first or defeating other enemies will be near impossible in advanced areas. Stheno and Euryale are the new Gorgons. We had Medusa as an ordinary enemy before, but she only affected a small area. It doesn’t matter where you are, they will transform ALL YOUR UNITS in your mob into stone, and you will be on your own for some time, trying to avoid them. We have plenty more of new enemies, but we don’t want to spoil them, so look for them in the update! * Kamikaze is actually the temp name, but I think we forgot to think in a proper name, and we already sent the strings to localization, so I think Kamikaze will have to do. As we announced last week, Okhlos is getting a juicy new update with tons of new content, changes on the gameplay, balance and fixes (and a few more things ;) ). This week I’ll talk about a new type of heroes and some big changes we did on the Units’ Markets. One of the biggest changes is the introduction of the Union Reps. You need to unlock these heroes first, but once unlocked and selected from the Agora, they will turn all bystanders appearing on the following levels into the same type. Which is awesome and very easy to read. In this way you can easily spot a very unique hero or unit. You can choose Union reps for each type of basic unit. But the interesting bit of this is the mixing of different heroes. You can choose citizens and slaves only, for example, and you always will be able to buy kings to increase your mob (kings can only be bought with citizens) and you will be able pick up a ton of items. 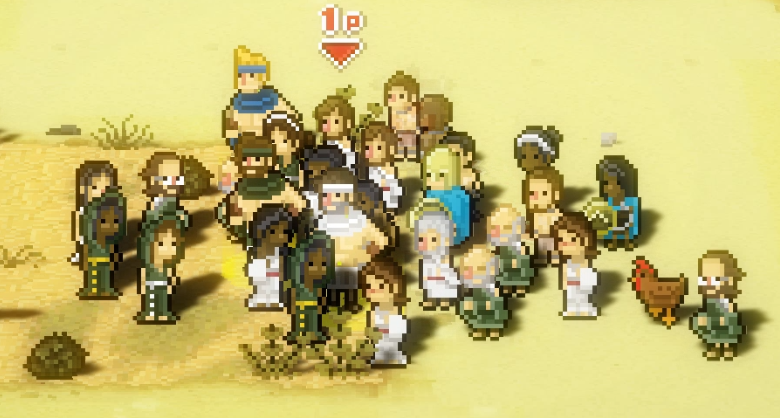 You can mix things up and get really weird combinations, which is something that we always tried to push in Okhlos, mostly with the heroes. This is a step forward in that direction. This mob has the Citizens’ Union Rep, as well as the Philosophers’ and Defenders’. Tons of lives and defense power and a huge mob! Just don’t expect to hit very hard. We determined a random type of unit, let’s say philosophers, and then randomly we set three types of units to exchange for them. So, if you had a few warriors to spare, you could buy more philosophers for your mob. Because of the random nature of the selection process, you would very often find that you couldn’t buy any of those (that’s why the options are blacked out). And with the introduction of our new Union Reps was worse because if you are full of warriors but you don’t have the option to utilize warriors as a currency, you simply are locked from buying anything. We changed things in two ways here. For starters, we used an algorithm to sort the store which is similar to the one we use in the Hero Market. Buying heroes in Okhlos is one of the most gratifying parts of the game, and if the heroes presented are always the ones you can’t buy, the player will feel frustrated. So we tweaked things a bit. We make a list of which heroes you can buy according to the units you have, and then we throw some randomness into the list. Now we do the same thing in the Units Market, we analyze which units the player has and then we present them with options accordingly. If you are playing with only one union rep, the choice in the store will be boring. You will always have only one option to choose, and the others will be locked. The other thing we did was to change the way the store is presented. Now, instead of always having a unit type which you can pay with three different currencies, you will always have the same currency and players will choose which type of unit they want. The options are presented based on what units you have, so it’s very likely that you will always be able to exchange units, and because the choice is about which units you get instead of how you pay for them, it simply feels better. Maybe this is obvious, but it is way better to be able to choose WHAT are you buying instead of HOW are you paying for it. And it only took us 5 months to figure it out! This is the first of many changes we are introducing in the upcoming update. What do you think? Remember, if you want to try it, just ask us the pass of the Steam branch! 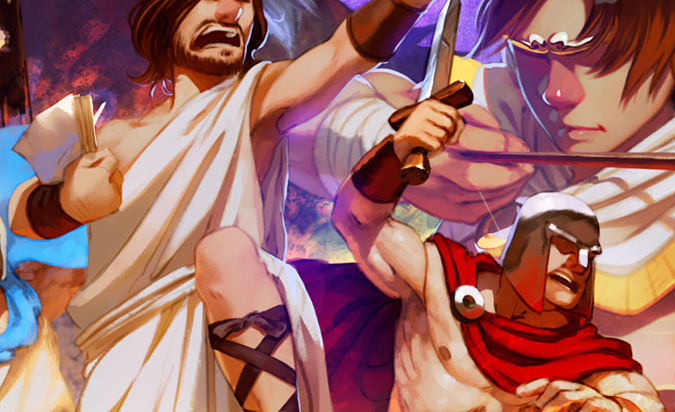 Okhlos is getting a cool new update! Get in the closed beta now! We’ve been quite busy these last few months, because we were working on a new update for Okhlos! We will still keep some details to our selves, but we need your help to test the new update! If you wish to participate, all you have to do is write us via Facebook, Twitter, our e-mail, or right here in the comments, and we will send you the magic word to enter the beta. Keep in mind that only if you already own the game on Steam will you be able to enter the beta. We need your help! If you find any issues whatsoever, please describe them and write us through any of our social media accounts, e-mail or right here in the forums! We are particularly looking for Mac and Linux testers. The beta will be starting soon and we have a limited quota of participants, so don’t hesitate! Here is a small snippet of what you can find in the new beta!